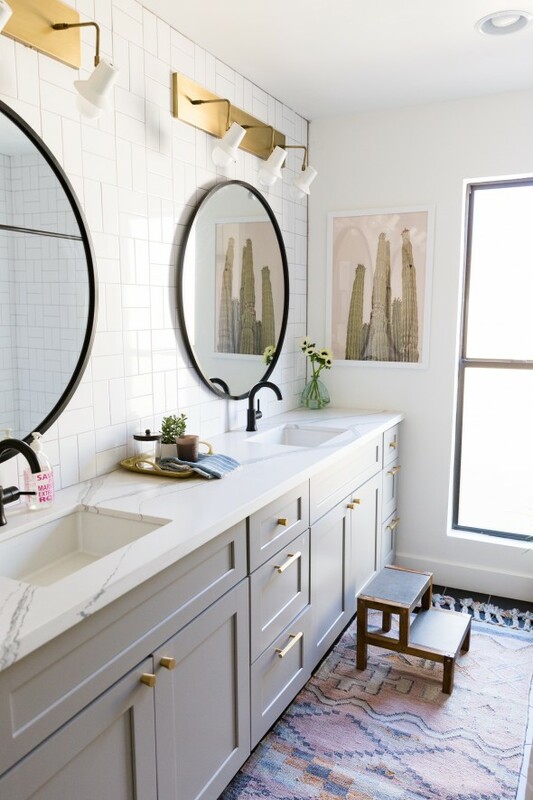 Today we’re sharing BOTH of the Gentry Project bathrooms! I love how these two spaces came together. And here’s the hall bathroom now! We used gray cabinetry from Madera Cabinets and Cambria’s matte Brittanicca quatrz. I love that the quartz has a matte finish instead of a polished, glossy finish. I prefer honed finishes on my countertops and I love that these Cambria tops are incredibly durable AND have that gorgeous matte finish! 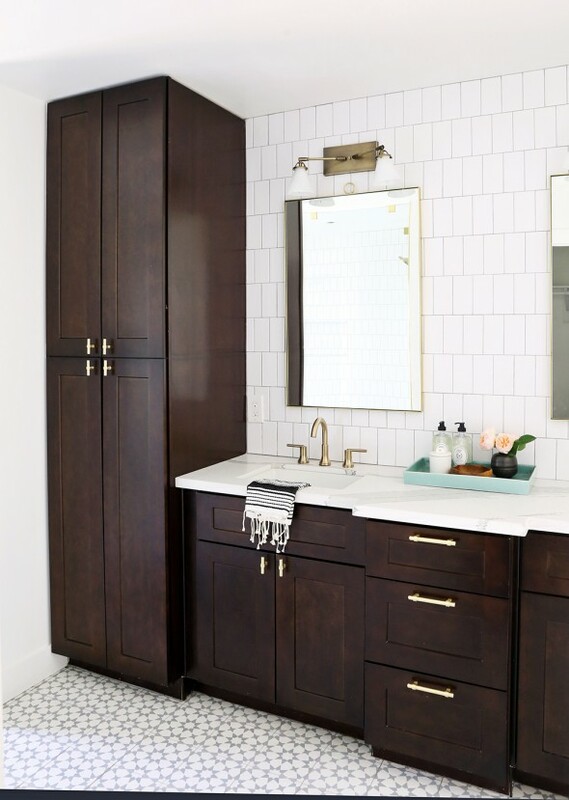 I’m a big fan of mixing finishes and we used a lot of flat black and unlacquered brass in both of these bathrooms. The sconces in both spaces were made in a collaboration we did with Lucent Lightshop. Isn’t that huge brass backplate amazing?! 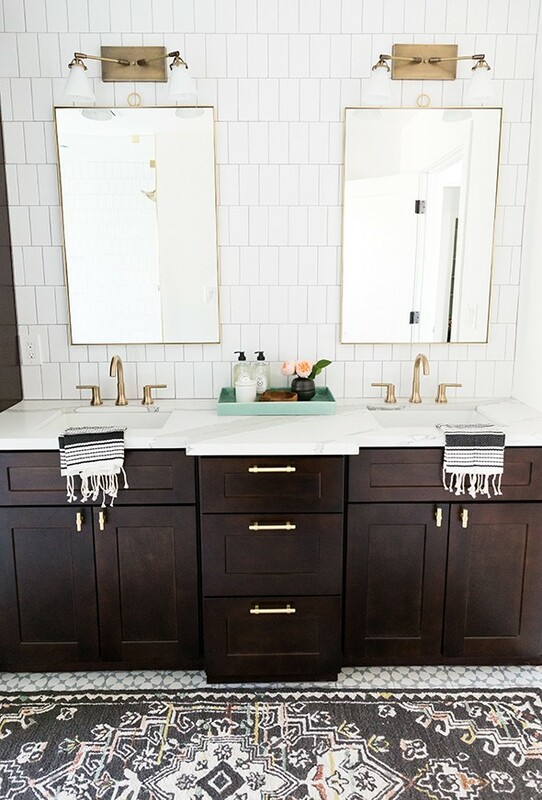 The brass hex knobs are another favorite (I love how they connect back to the black hex floor tile!). And that pink runner was the PERFECT find for this cute space! The master bathroom, just down the hall, turned out beautifully! 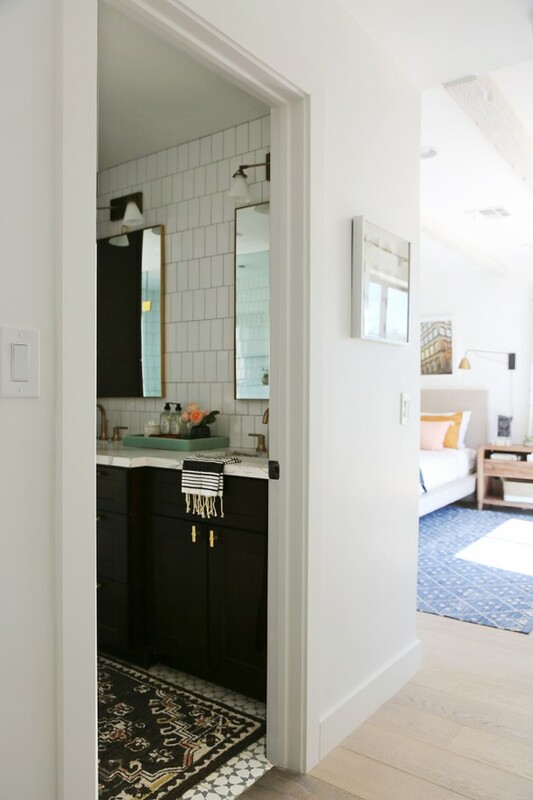 (PS Here’s a tour of the finished master bedroom, in case you missed that reveal!) 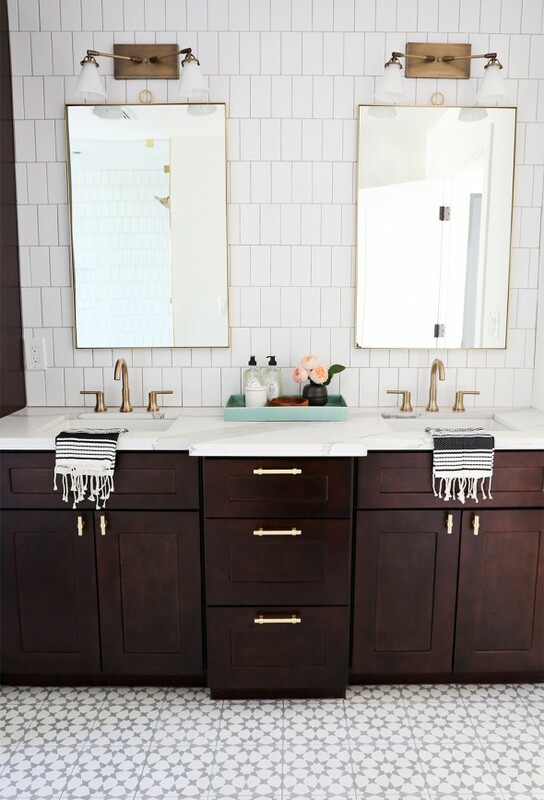 I love that this bathroom has a little more of a grown up vibe with the darker cabinets. 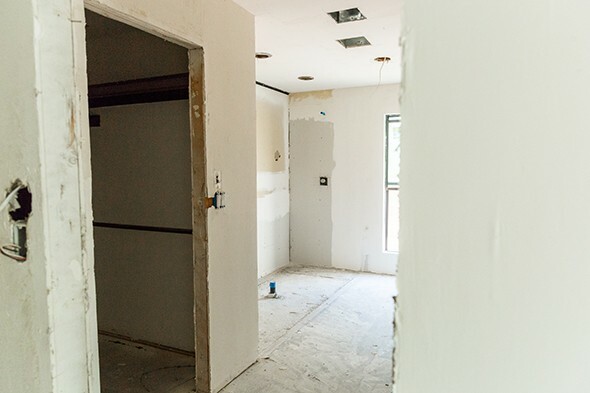 Here’s what we started with in the master bath. 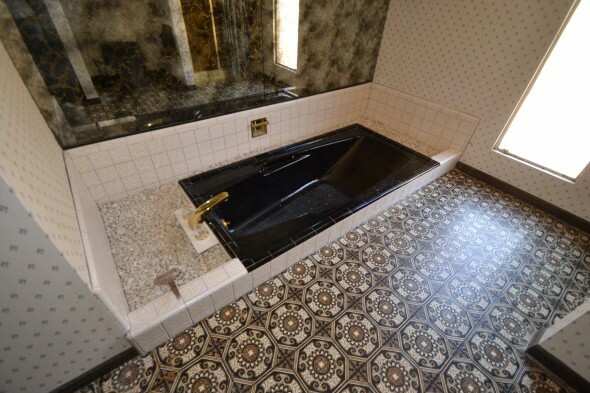 A completely different layout, smoked mirrors, black plumbing fixtures and the weirdest tub surround that literally had kitty litter in it?? And here’s the new light, bright bathroom! LOVE!! All of the plumbing in the house is from the Delta Trinsic collection. We installed a double shower in this bathroom and used the Trinsic trim kit in the Champagne Bronze finish. 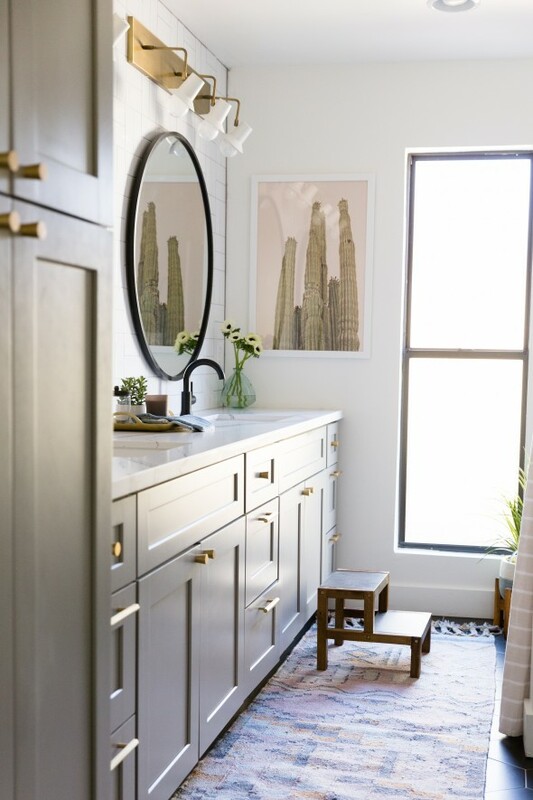 I love how the bronze color plays so nicely with the other brass and gold tones we have in the space in the mirrors, cabinet hardware and the Lucent Lightshop sconces. I love those milk glass shades!!! I hope you love these bathrooms as much as I do! I think they turned out beautifully especially for the budget we needed to stick to! 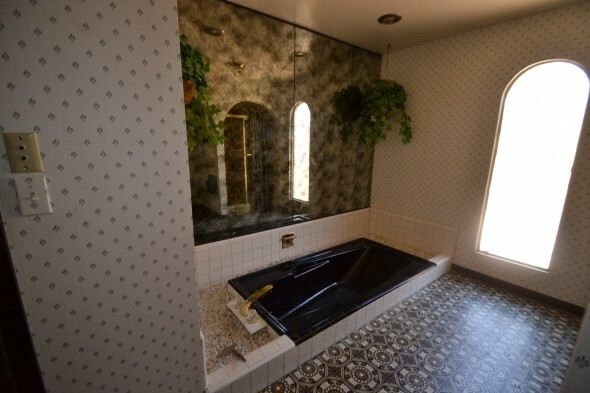 How did anybody get out of that sunken tub without some sort of grab bar or ladder??? . I love what you’ve done – great job! Wow!!! What a transformation! 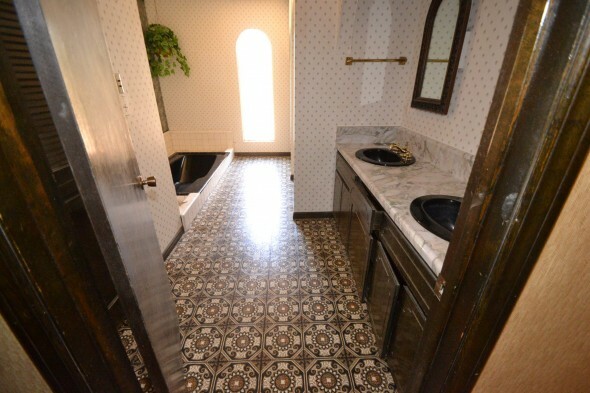 Absolutely loving the tilework. Gorgeous! 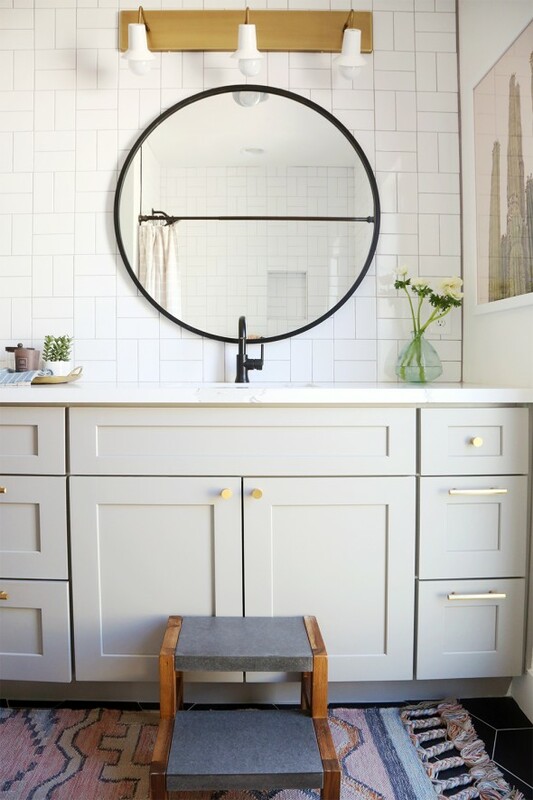 I love reading your blog and these bathrooms are beautiful! I would love a future post about how you plan and budget for renovation and design work. I need to do some of this myself and am feeling overwhelmed with the different options and prices and knowing where to splurge/save and seeing that it all comes together… you do such a beautiful job with that and I would love to learn from you. I’d love to hear your thoughts on this too, Jenny!! 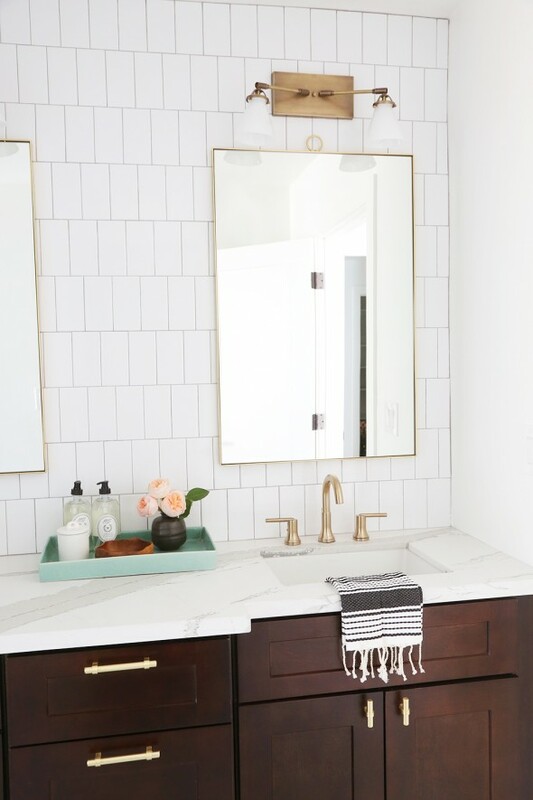 I LOVE when subway tile is vertical! We did it in our shower at home and it makes the shower feel so much taller. It’s also different from most other showers! Both bathrooms look fab! I love both of these! 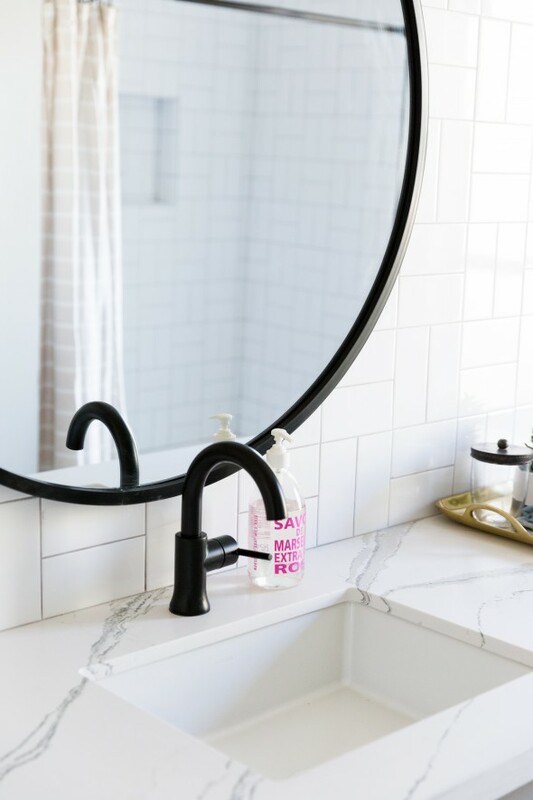 We are hoping to renovate our master bath soon, and these are giving me some great ideas. Thanks for sharing! Both bathrooms look beautiful! I’m just wondering where you hang the bath towels? I need some inspiration. Great fan of your style! It was hard to get pretty photos of all the angles but we have row of hooks in both rooms! I like hooks better than towel bars, but it’s def a personal preference! Do you have a link to those hooks? Saw them on your Instagram stories and trying to track them down! jenny, these are both gorgeous! 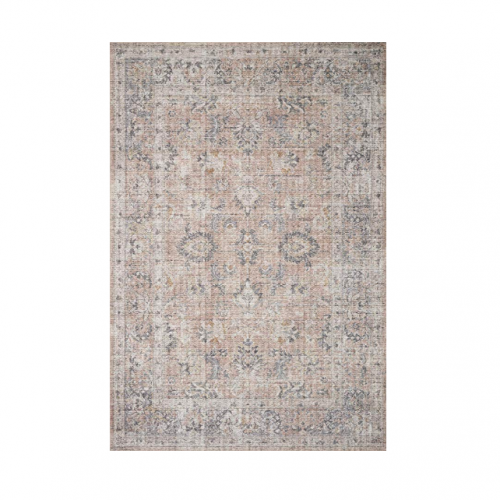 I’m curious – do you really purchase tile from Wayfair? I would be so hesitant, but I guess you’ve had a good experience? thanks! Gorgeous! 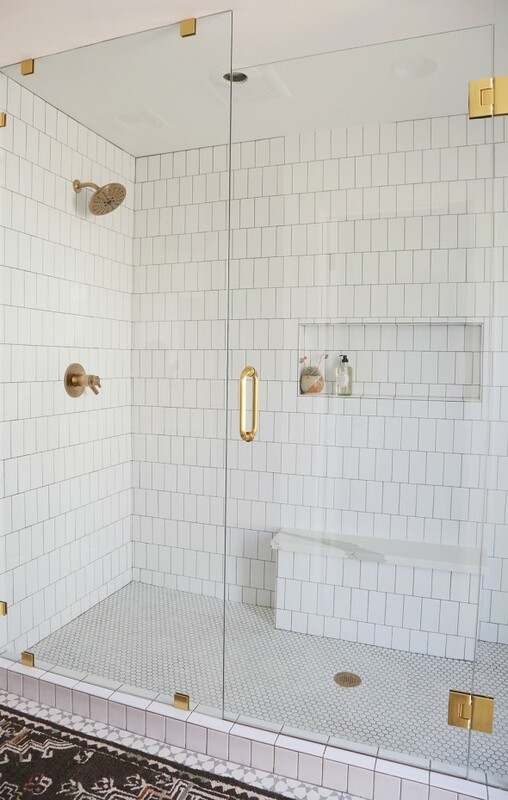 Wondering what color grout you used in the master bath shower floor with the white hex tiles (and presumably the subway tiles as well)? It’s really stunning! Congratulations on a beautifully executed vision! I think it’s Mapei Dolorean Gray. 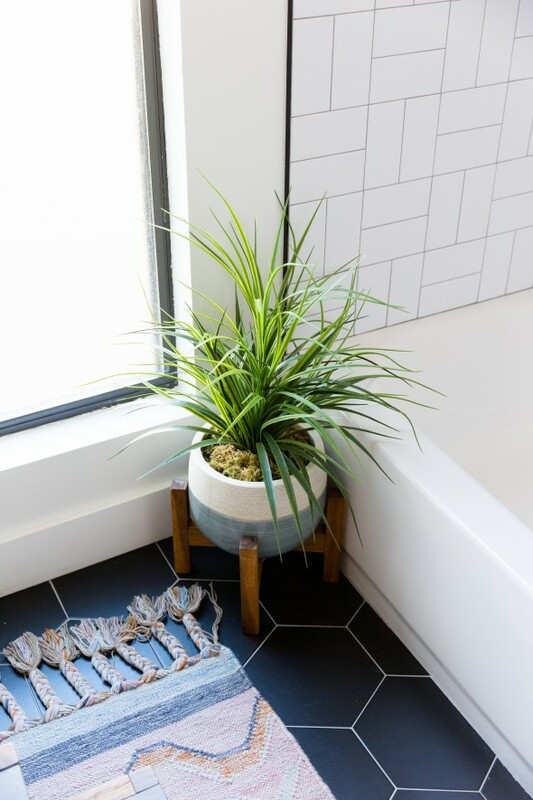 We matched the pattern in the cement tile shop tile! 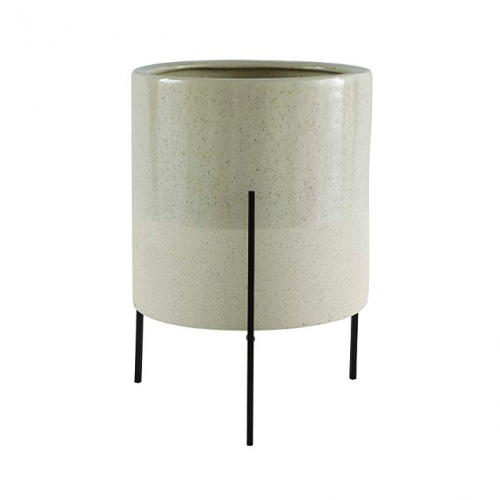 Is the master bathroom sconce not available from Lucent? I’ve looked on their site that you linked and can’t seem to find it. So appreciate all of the resources you post! Have been reading along since the post about your Christmas baby born at home and I think this is my first comment. 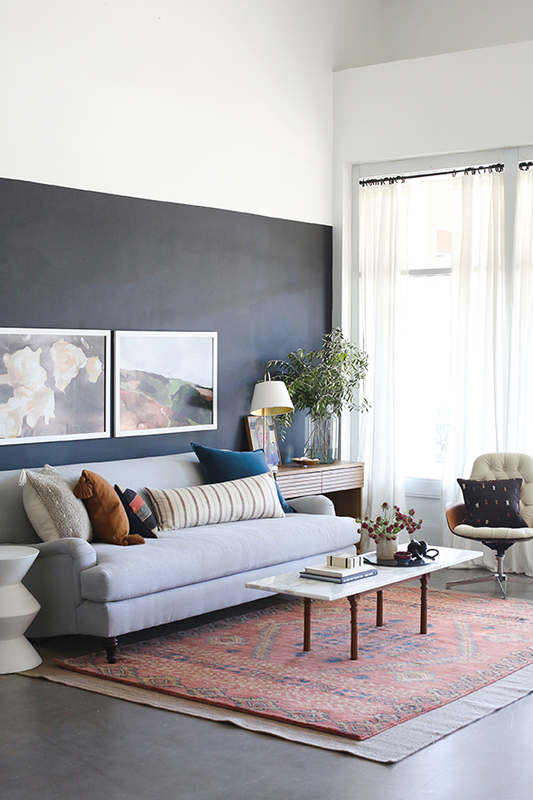 Have enjoyed seeing all of your adventures and inspiration for my own home over the years. THANks for all you do! 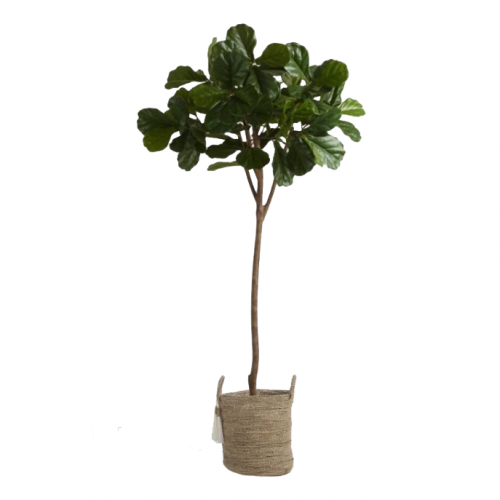 You should contact Lucent about these! They might not be listed, but they can make you anything! Can you link to the hex tile in the shower? Thank you! Love both spaces! I’m curious where the shower door hinges and handle are from. I’ve been looking everywhere for those in the finish you used. Thank you! I love the whole house! Thank you for the tour via insta story. Did you share the floor plan? I really like it and would like to build something similar. 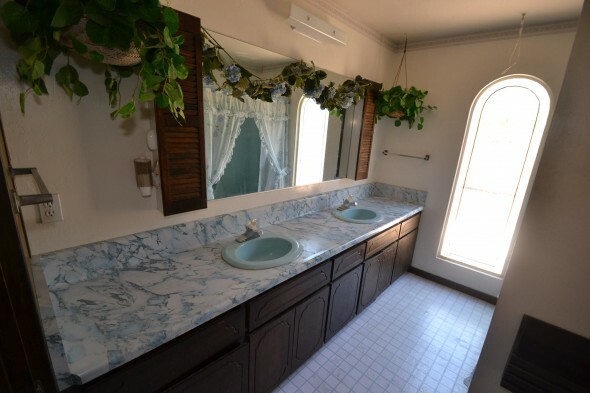 A shame you couldn’t find a way to work with those blue and black plumbing fixtures…snort. Everything looks smashing. Lucent (and you) really create beautiful work. 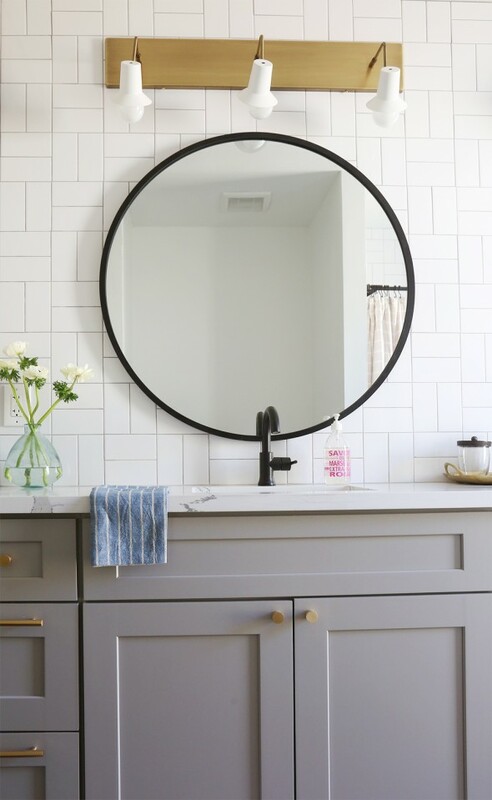 The tile mix, the cabinets, the mirrors- it’s all just perfect. Great work. Hi Jenny + Team! Amazing. So many top notch design choices. Love it. 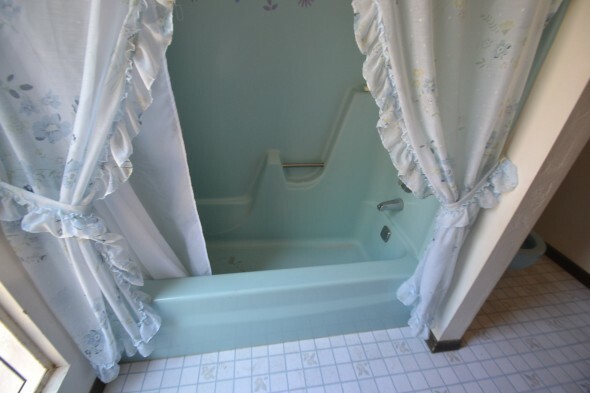 Just wondering – why no glass door for the kids shower? Why did you choose curtain there? Thanks! Hi Jenny, can you share the color of the cabinets in the hall bath? Is it the standard Grey Shaker on Madera’s website? Many thanks! Yes! All of the cabinets at Gentry are Madera’s standard finishes! :) They are great! Your website makes me so happy. Your design aesthetic, your generosity with links, the lovely photographs, the colors — what a wonderful way to wake up while I sip on tea. Thank you for adding beauty to my life…. Thank you!!! What a nice compliment! :) So glad you’re here! Both of them look so wonderful! 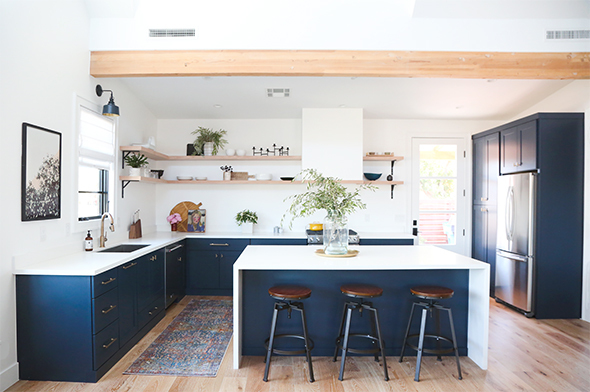 There’s a sense of cohesiveness between the two designs (although different cabinetry color) and I really like that. Your designs are always so spot on!! Hi Jenny, any chance you can share a ballpark of what you spent on the custom Euro Style shower door? 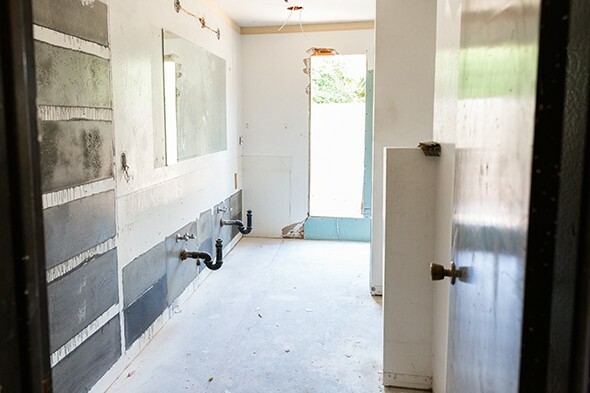 We just tore our bath down to the studs and are trying to price out our labor options and the shower door is the one thing I need to make sure we have space for in the budget for – I’m guessing 2-3k? 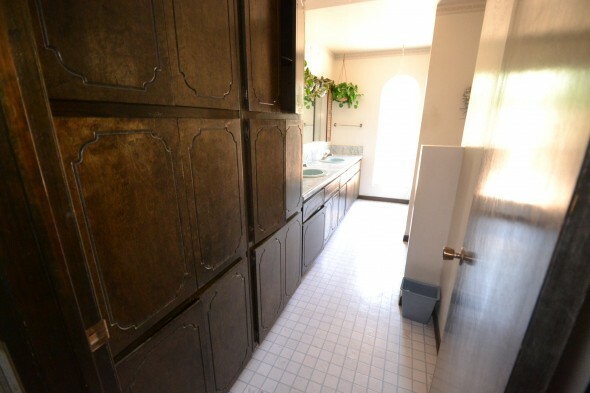 By the way, going with the lovely hex tile you used in white for the walls and the champagne bronze hardware! Love it! Xin chào. Nếu bạn yêu thích làm mộc, nghề gỗ hoặc thiết kế và trang trí nội thất gỗ cho nhà ở của mình thì hãy truy cập vào nghego để tìm hiểu kiến thức, hoặc chia sẻ kinh nghiệm làm đồ gỗ nội thất của mình nhé! Hi, love your remodel! Very inspirational. I think the bathroom counters are marble? 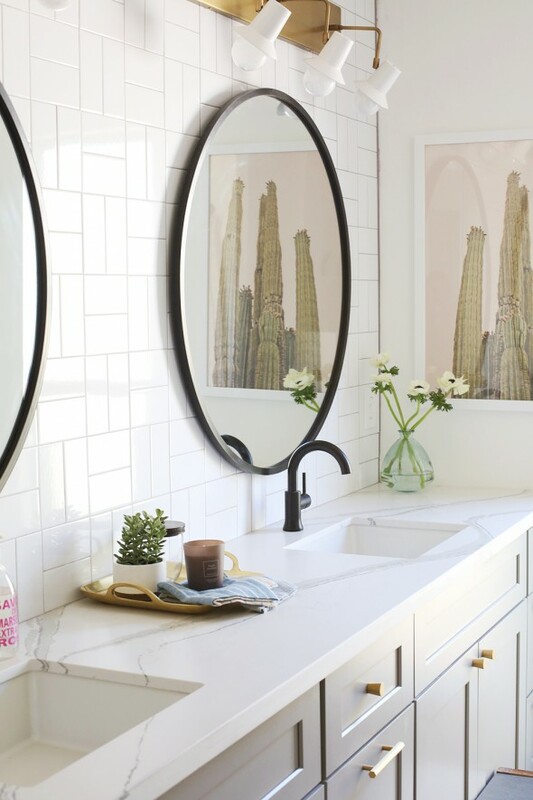 How do you feel about using marble for countertops in a bathroom? I love the master counter but worried about maintenance. Thoughts…. Also, I love the clay tile but quite expensive and we have large square footage. Do you have any other suggestions of material that would tie in well with the look you have? Hi! 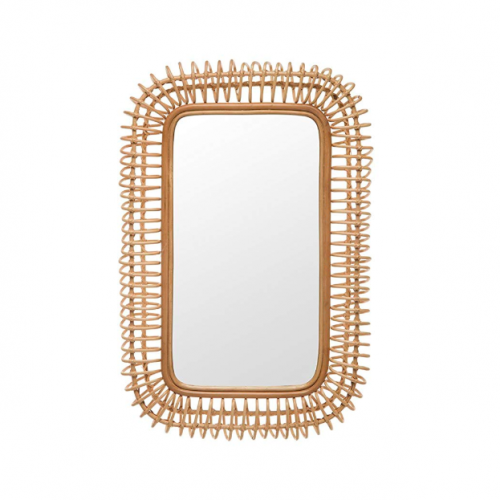 I am currently doing a bathroom remodel and found the same round mirrors. What size did you use, 24 or 37 inches? Hi there. 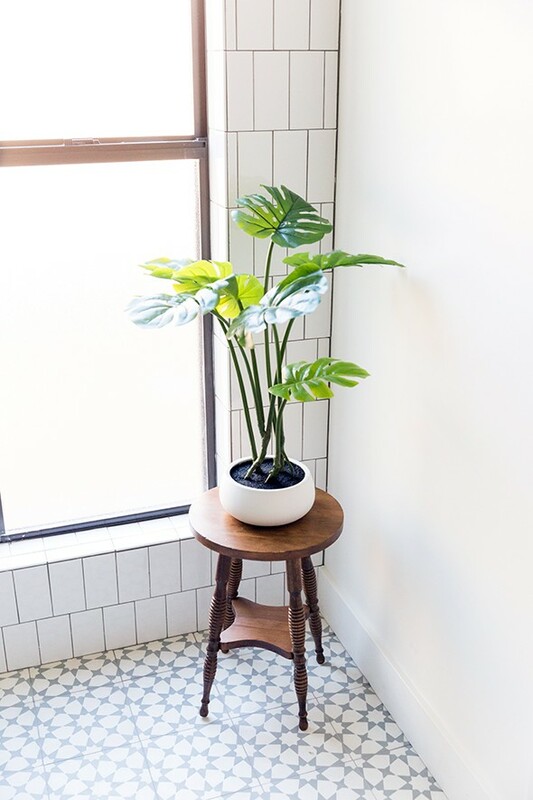 Love this tile layout and trying to recreate the look. 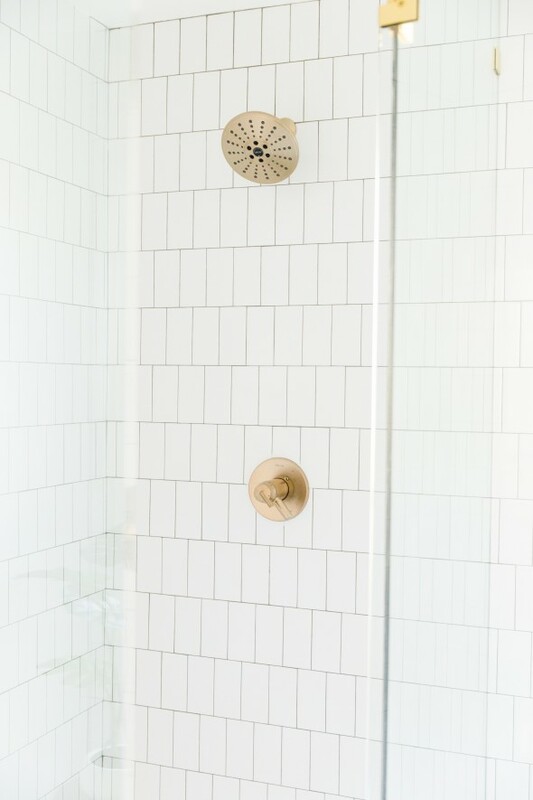 Did you use 1/16 or 1/8 spacing for the shower tiles? Thank you!! 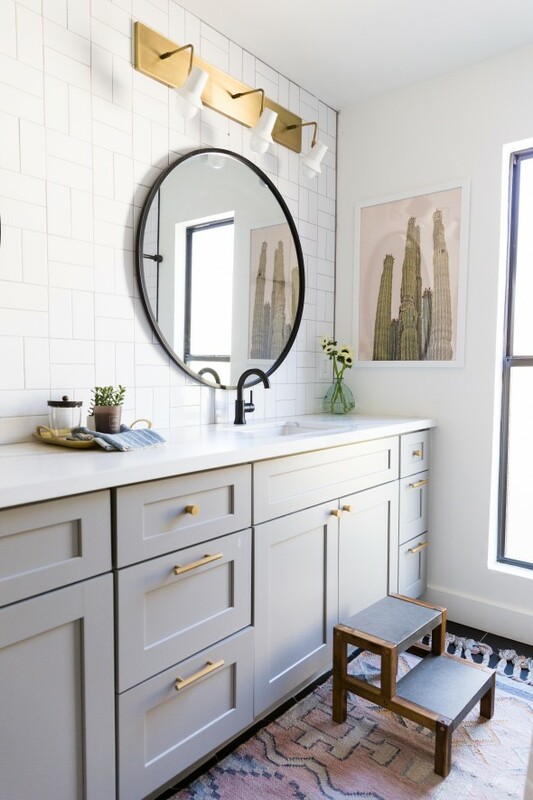 Gorgeous bathrooms! I’m remodeling my daughters bathroom as a surprise. I love what you did! 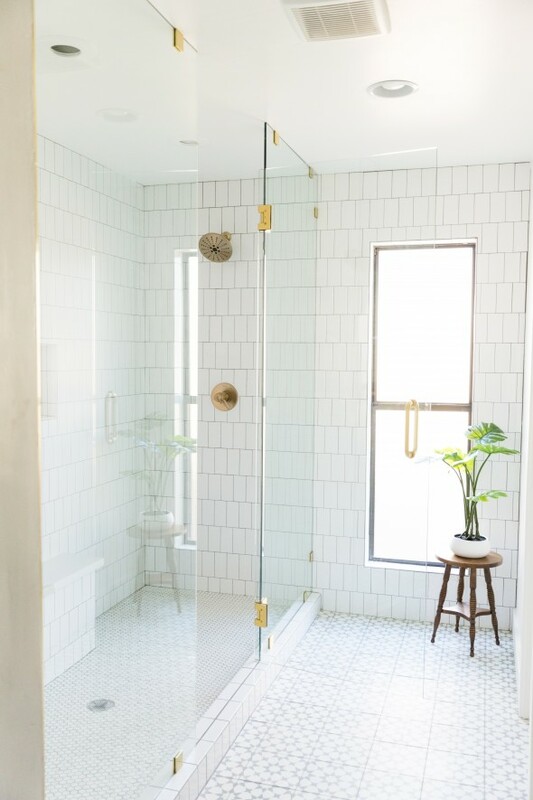 I’m trying to find the clear glass shower door with the gold hinges and hardware. Do you remember where you got it? They are hard to find! I appreciate your talent and help. Thanks in advance!